5 PAIRS OF STUNNING DRAMATIC WISPY FALSE EYELASHES. • Gorgeous long, thick wispy lashes. • Can be reused when removed with care. We appreciate your understanding. Natural lashes (Soft lashes and Soft silk and knot-free-make you comfortable when used). 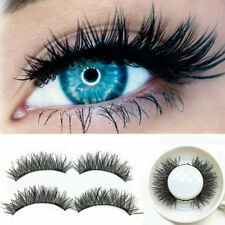 Fascinating eyelashes and best for party! Material: Mink Hair. Note: Does not include glue; 1 Box (1 Pairs False Eyelashes). • Handmade with a natural curve. • Colour: Black. • Long, full effect. • Can be reused when removed with care. 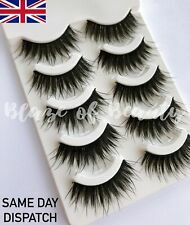 5 Pairs Natural False Eyelashes Fake Easy Use Makeup Eye Lashes Lash UK Seller. 5 PAIRS OF EXTRA LONG FALSE EYELASHES. • Flexible lash band. • Can be reused when removed with care. We appreciate your understanding. Blaze of Beauty. Hold the eyelash on the root of your natural lashes with pressure. --These long false eyelashes are made by high quality synthetic fibers with sparse and cross style, which can match your casual and party makeup. 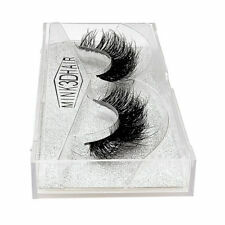 Description: Great for adding definition and length Long, thick wispy lashes Handmade with a natural curve Flexible lash bands Extremely comfortable and easy to apply Compatible with your preferred eyelash adhesive Can be reused when removed with care Colour: Black Length: Approximately 12-14mm Note: Not Included Glue Packing Included: 5xPairs Eyelashes. 2 pairs of eyelashes( Inside the box, the magnet eyelashes are stuck together for each pair of two pieces. Apply your mascara (Will be better to fix the eyelashes). This eyelashes type perfect for eye corner or middle eye place. ). 5 pair False Eyelash(No Glue). Match your causal and party makeup. Can be removed by eye makeup remover. For party and daily use. Colors: Black. You may also like. Make your eyes look bright and attractive. 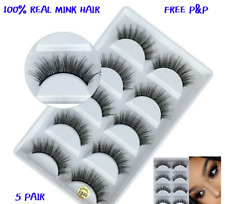 It is 100% real mink hairs or natural. Material: 100% Real Mink ABS Band. Peel the eyelashes from the case with carefully. Check the eyelashes with your eyeliner's length and apply it suitable length of eyelash. Hold the eyelash on the root of your natural lashes and add a bit pressure on it. If necessary Apply the glue along the false eyelash root with cotton bud. Material: mink hair. Handmade natural soft long thick false eyelashes. Material: mink hair. Hold the eyelash on the root of your natural lashes and add a bit pressure on it. Handmade natural soft long thick false eyelashes. Carefully remove the eyelashes from the case. Compare false eyelashes with your eye lines and trim to suitable length and width. Material: 100% Real Mink fur. False Eyelashe Type: Full Strip Lashes. Hold the eyelash on the root of your natural lashes with pressure. False Eyelashes Terrier: Plastic Black soft Cotten Terrier. False Eyelashes Style: Long & Natrual Cross.